Valentine’s Day will be here before we know it. Kids love handing out Valentine’s Day Cards…. they just love it. Plus, they love receiving them as well. I don’t know about you, but every year I try to help my kids come up with different Valentine Card ideas than the year before. It gets difficult after a while to keep coming up with unique ideas. Well, I thought I would help you with that by showing you some really cool Candy Valentine’s Day Card Ideas for Kids. I found them all while scrounging the internet for you. Each are unique and a ton of fun to make. 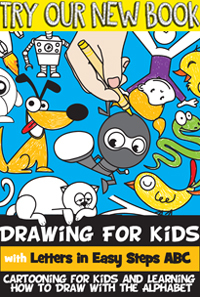 I’m sure you and your kids will find something here that they will enjoy making and giving to their friends and family. So, let’s get started. Oh boy…. do I have a treat for you today. 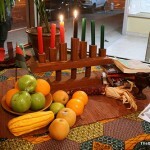 In this post I have compiled 14 Kwanzaa crafts from around the internet. They are all perfect for your children to make. Whether you celebrate Kwanzaa or not these crafts are great to help teach your children about Kwanzaa and the African culture. Many of them not only incorporate the three colors of Kwanzaa (red, green & black), but they also help teach you about the 7 Principles of Kwanzaa…. Unity, Self Determination, Collective Work & Responsibility, Collective Economics, Purpose, Creativity and Faith. These are wonderful principles to have and to teach your children. 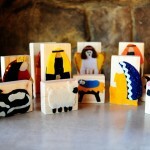 So, check out these Kwanzaa crafts…. you are sure to find a few to do with your children. 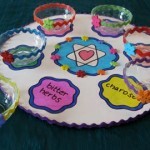 Oh boy, do I have a fun craft for you today perfect for the Thanksgiving season. 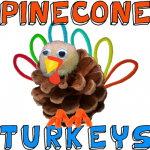 Today I’m going to show you how to make Pinecone Turkeys perfect for Thanksgiving. These pinecone turkeys will look great around the house as Thanksgiving decorations. Plus, your kids will love to make them. 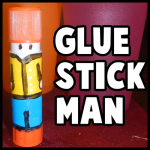 They are a lot of fun and your kids will have great pride in knowing they made items you could actually put around the house as decorations. So, grab the materials needed and let’s get started. Last week I showed you how to make a Milk Jug Vampire Candy Holder. Well, you seemed to have loved that idea, so I thought I would show you another cool Milk Jug Halloween Craft. 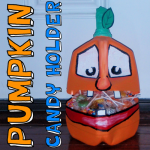 Today I’m going to show you how to make a Pumpkin Milk Jug Candy Holder perfect for handing out candy this Halloween. Kids will love reaching inside this Pumpkin for the treats…. almost as much as your kids will love making it. Keep in mind you will need some Adult Help for this craft as a knife and/or a scissor will be needed to cut open the milk jug. So, let’s get started. I don’t know about you, but when I think of a Leprechaun I think of the big, green hat he wears. 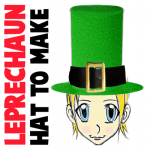 Today I’m going to show you how to make your very own Leprechaun Hat for St. Patrick’s Day. After all, St. Patrick’s Day is only a little over a week away. Now is the time to get started making and displaying your St. Patrick’s Day crafts. So, grab the materials needed and let’s get started with this fun St. Patrick’s Day craft. 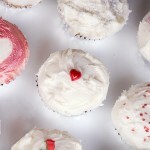 Today I have a fun craft to do with your left over Valentines Day Heart Shaped Box. 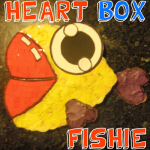 I’m going to show you how to make a Fish out of a Heart Valentines Day Box. 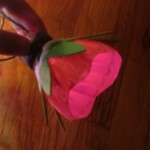 This craft is not only a lot of fun, but it is a great way to recycle those used Valentines Day Boxes…. so you don’t have to just throw them away. And, the fish not only turns out totally cute, it also gives you a secret storage box to store your small secret things in. Now, that is fun!! So, grab the materials needed and let’s get started. I have a fun craft for you today….. and the coolest part is you will get to use your old Valentines Day Heart Box that you had been given as a gift on Valentines Day. Today I’m going to show you how to make a Kitty Cat out of a Heart Valentines Day Box. 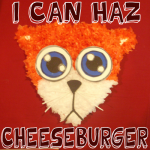 This cat is made from tissue paper and paper plates….. it is so much fun to make. Once you are done with this craft not only will you have a cute kitty cat, but you will also have a super cool box to store whatever you would like. So, let’s get started. Yesterday I showed you how to make a an Easy George Washington Hat for President’s Day. Well, it wouldn’t be right to make a hat and celebrate George Washington’s special day if we don’t do the same thing for Abraham Lincoln. 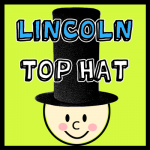 So, today I will show you how to make an Abe Lincoln Top Hat for President’s Day. After all, President’s Day is about honoring both George Washington and Abraham Lincoln. And, what better way to honor Abraham Lincoln than to make his top hat. So, grab the materials needed and let’s get started. I have a fun craft for you today. 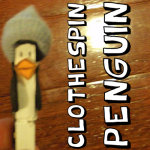 I’m going to show you how to make a Clothespin Penguin Ornament. It turns out so cute and perfectly festive for the Christmas Season. What would be even cuter is to make a few of the Penguin Ornaments and spread them around the Christmas Tree. So, go grab a clothespin, old glove and the rest of the materials needed and let’s get started. You know how much thought goes into your child’s costume!! But, sometimes the treat basket is an afterthought. I know…. I use to carry my Halloween candy in a pillow case. But, imagine how cute your child will look carrying this Mummy Trick or Treat Basket. And, chances are no one else will have the exact basket. 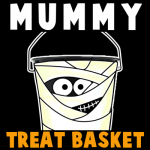 Today I will show you how to make your very own Mummy trick or treat basket. Halloween is coming up and what do the kids love about Halloween more than anything?! Trick or Treating, of course. 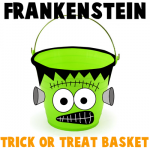 Today we will be making a Frankenstein Trick or Treat Basket perfect for collecting candy. Made from a simple green bucket this Trick or Treat basket will be a huge hit this Halloween season.